Vietnam is one of Southeast Asia’s most diverse countries, a land where lime-green rice paddies and floating markets meet bustling cities. You can sail amongst towering limestone karsts in UNESCO bays, cycle through historic towns, sample delicious noodle soups and relax on white-sand beaches. So, why not discover the top 10 things to do on a Vietnam holiday? 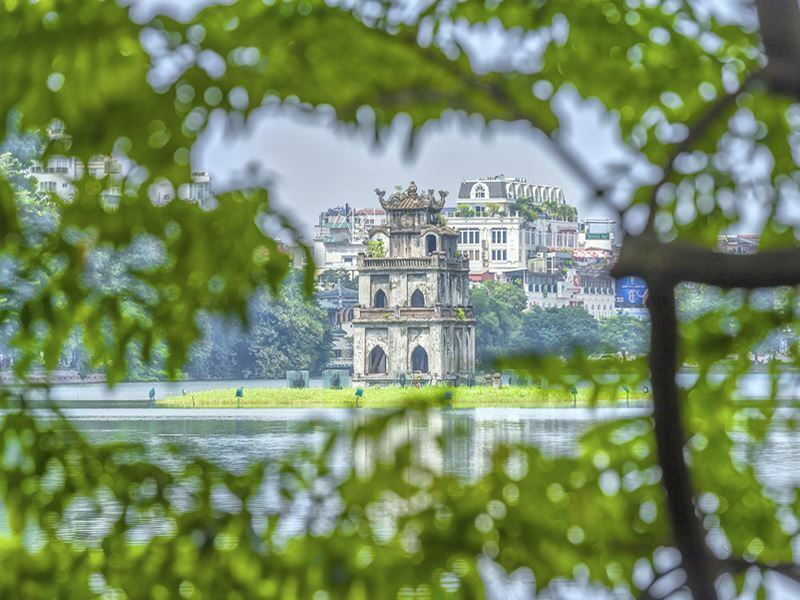 What: Hanoi is Vietnam’s vibrant, chaotic capital and the second-largest city in the country, home to over 1,000 years of history. Take a cyclo tour through the maze-like Old Quarter, where throngs of beeping motorbikes crowd the streets while people sit on tiny, pavement-side stools eating Pho. There are architectural treasures to unearth, from crumbling French colonial buildings and St Joseph’s Cathedral, to the Chinese-style Temple of Literature and Tran Quoc Buddhist Pagoda. Uncover some fascinating history at the Hoa Lo Prison and Vietnam Women’s Museum and take a stroll around peaceful Hoan Kiem Lake, where locals gather to exercise. Highlights: Visit the mausoleum of Vietnam’s revered revolutionary leader Ho Chi Minh and his presidential complex, where you’ll find a grand yellow palace and traditional wooden stilt house. Stop by a Banh Mi street cart to sample a famous pork sandwich and don’t miss a northern speciality: egg coffee. End the night with a water puppet show, an art form that originated in the Red River Delta region. Where: Quang Ninh Province, north eastern Vietnam. 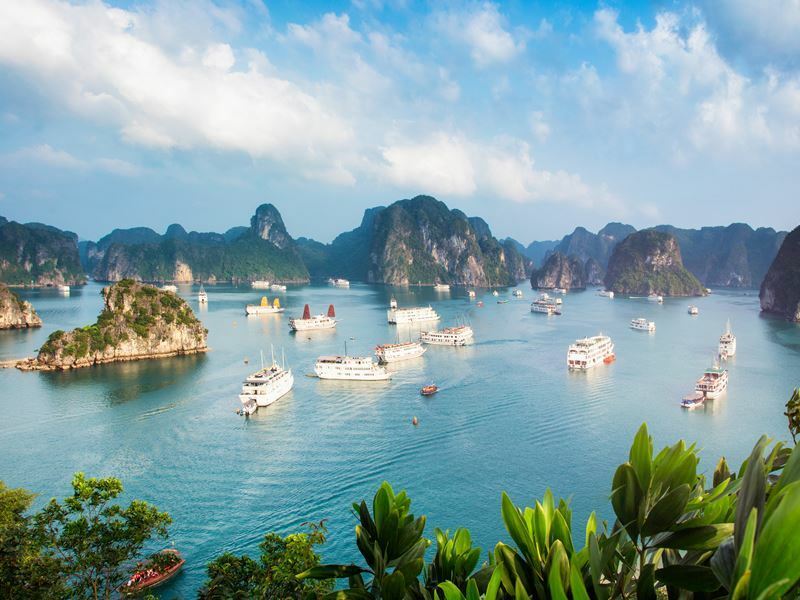 What: Halong Bay is Vietnam’s most prominent attraction, a UNESCO World Heritage Site that has been voted one of the New Seven Wonders of the World. Cruise the paper-flat waters in a rustic Vietnamese junk boat surrounded by over 2,000 limestone karsts formed over 500 million years. Navigate past unique rock formations such as Dinh Huong Islet, which is shaped like an incense burner and appears on the 200,000 Vietnamese Dong note. There are mystical caves, forest-topped islands, sandy beaches and mountain viewpoints to explore. You’ll also have a chance to see four floating villages, which are home to local families who’ve inhabited the bay for generations. Many tourists add an overnight stop on Cat Ba, Halong’s largest island, to enjoy its golden beaches, national park and French fort. Highlights: An overnight cruise on Halong Bay will give you time to visit some of the area’s most impressive caves such as Sung Sot, the Amazing or Surprising Cave, which has huge chambers and is full of century-old stalagmites and stalactites. Watch the sunset over the bay from Titop Island and try a spot of night-time squid fishing. Wake early to catch the sunrise from the deck and then take a kayaking trip across the Bay through floating villages and caves. Where: Lao Cai Province, northern Vietnam. 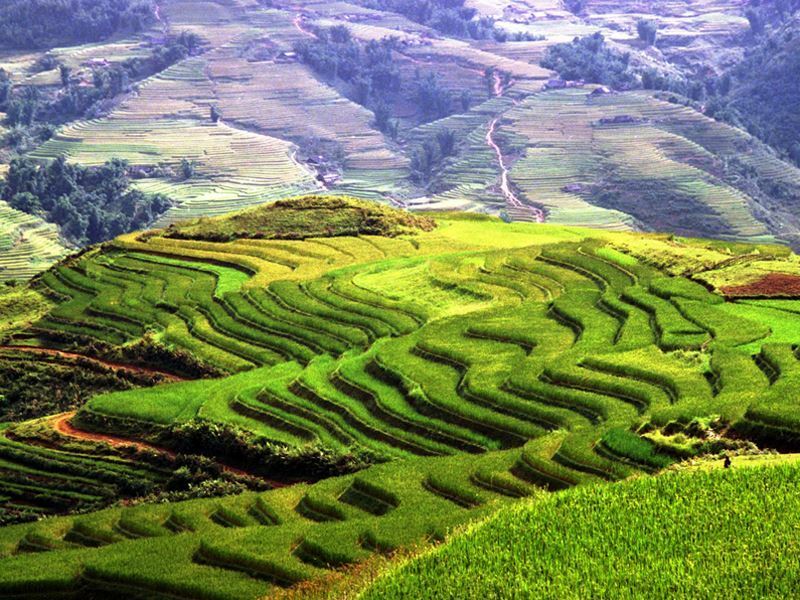 What: The mountain town of Sapa lies in the far north of Vietnam near the Chinese border. Located at the top of a deep valley surrounded by mountains, Sapa was once a French hill station popular for its cool alpine air. While the town itself is fast becoming a tourist mecca, it still offers magnificent views of never-ending rice terraces and, on a clear day, the snowy peaks of Fansipan, Vietnam’s highest mountain. The real beauty of Sapa lies in the surrounding countryside where you don’t have to trek far to find rural hill tribe villages, staircases of rice, waterfalls and forests. Highlights: Take a day trek along buffalo trails through deep terraces of rice and bamboo forests. Along the way you’ll venture through hill tribe villages such as Ta Van, Cat Cat and Ta Phin. These are home to members of the Red Dao, H’mong and Black Dao groups, who wear brightly-coloured, embroidered clothes and headscarves. Where: Thua Thien-Hue Province, central Vietnam. What: Hue is Vietnam’s former capital and seat of the once powerful Nguyen Dynasty, who ruled the country from 1802 to 1945. The city straddles Song Huong, the Perfume River, and is so stuffed with history that it’s been designated a UNESCO World Heritage Site. The must-see attraction in Hue is the 19th century Citadel, also known as the Imperial City, a sprawling complex where the emperors lived and ruled. On the outskirts of Hue you’ll find the decorative tombs of the last Vietnamese emperors such as Minh Mang and Khai Dinh. 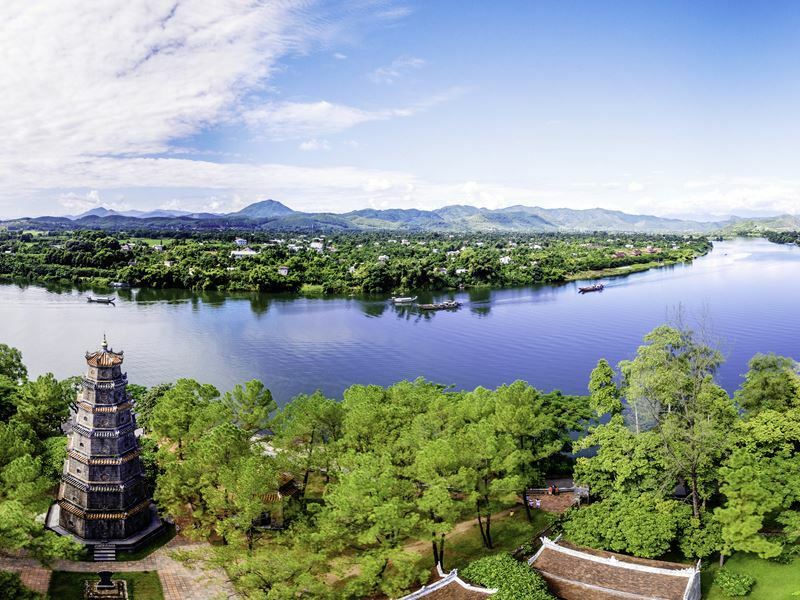 Another beautiful landmark worth visiting is the octagonal, 21-metre high Thien Mu Pagoda, which overlooks the river. Highlights: Allow at least three hours to explore the Citadel, a walled area surrounded by a moat and filled with palaces, shrines, scenic gardens and the Forbidden Purple City. Take a cyclo ride to see more of Hue, including Tinh Tam Lake and Tay Loc Market and then dine on Com Hen, a tasty dish of clam rice, washed down with a Hue beer. Where: Ninh Binh Province, northern Vietnam. 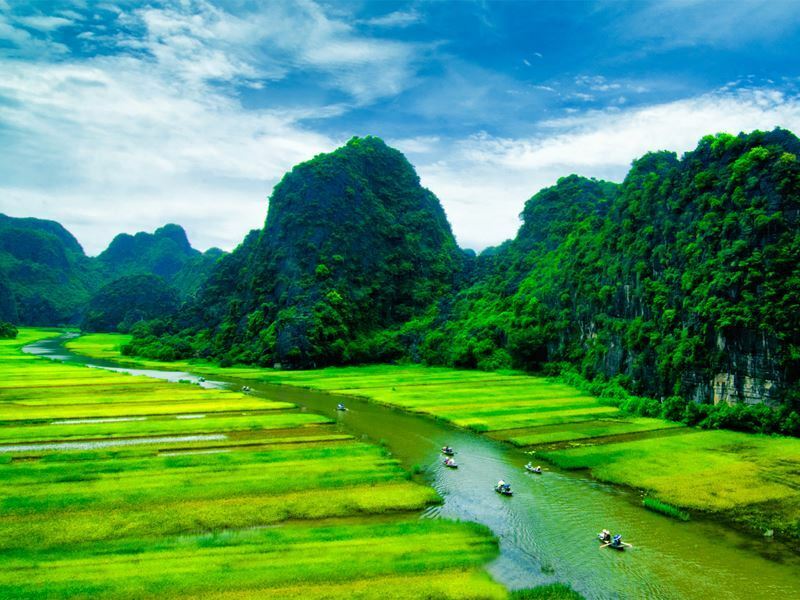 What: Tam Coc is often referred to as ‘Halong Bay on land’ as you can drift down rivers surrounded by floating rice fields bordered by limestone outcrops. To get an aerial view of this unique landscape, hike up to Mua Cave and then cycle out to visit the cliff temples at Bich Dong Pagoda. Further afield you’ll find Bai Dinh, the largest complex of Buddhist temples in the country, and the ruins of one of Vietnam’s former capitals, Hoa Lu. For outstanding nature and unique wildlife, take a trip to nearby Bird Valley or Vietnam’s oldest national park Cuc Phuong. Here you can see critically endangered Delacour’s langurs in the primate rescue centre. Highlights: Locals, who’ve mastered the art of rowing with their feet, will take you on a round trip down the river through the three famous grottos that Tam Coc is named after. On the way, you’ll pass local traders in wooden boats and fishermen collecting shrimp, while soaking in the views of vivid-green rice paddies and jagged limestone mountains. Where: Quang Nam Province, central Vietnam. 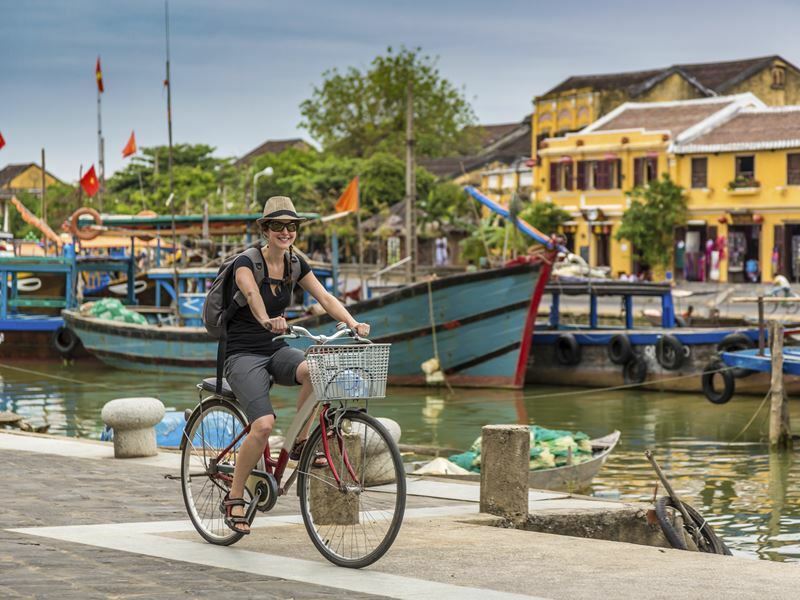 What: Cycle through the tree-lined streets of Hoi An, an ancient colonial port dating back to the 16th century. The city has been designated a UNESCO site for its well-preserved, unique fusion of Chinese merchant houses and temples set amongst pastel-coloured French buildings, Vietnamese tube houses and an ornate Japanese bridge. Thanks to Hoi An’s vehicle ban, the city has a tranquil vibe. However, there’s plenty of sightseeing opportunities and the streets are a haven for shoppers, offering traditional crafts, tailor-made clothes and a produce market. When the sun sets, the yellow buildings along the riverfront are lit with colourful lanterns and make a stunning setting for a meal. Highlights: Visit an express silk tailor to get yourself a bargain, made-to-measure outfit that can be ready in 24 hours or sent straight to your home country. Once you’ve visited Hoi An’s famed sites, head to one of the nearby beaches for some relaxation. Cua Dai is a popular spot with perfect fine sands, while further north you’ll find An Bang, a quieter beach. Where: Khanh Hoa Province, southern Vietnam. What: Enjoy some downtime in Nha Trang, one of Vietnam’s top beach destinations and scuba diving sites. Both tourists and Vietnamese alike flock to the city for its crescent-shaped six kilometre stretch of sand lapped by turquoise waters and set against a mountain backdrop. The beach is fringed with a bustling promenade lined with bars and restaurants which come alive after dark, offering some of the best nightlife in Vietnam. There are also nearby hot springs, the Po Nagar Cham Towers in the centre of the city and a cross-sea cable car to Hon Tre Island to keep you occupied. 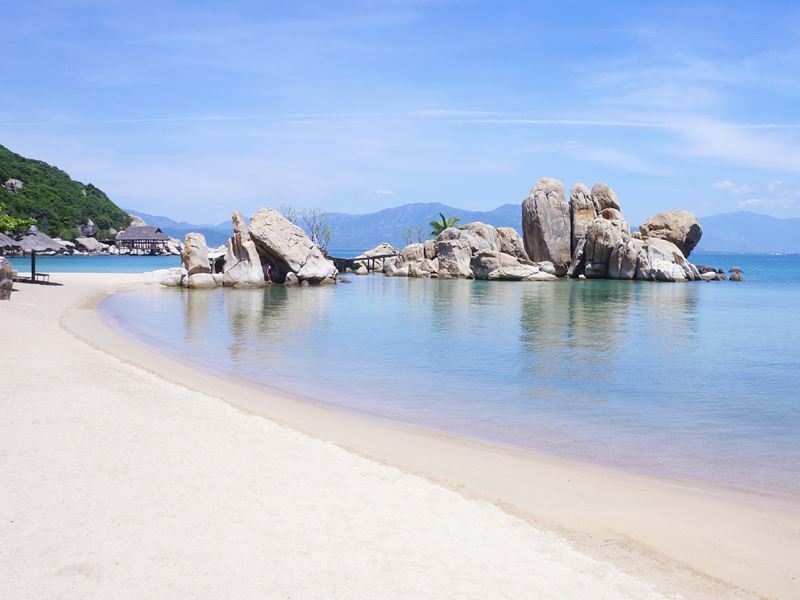 Highlights: Nha Trang is the perfect place for some restful beach time but if you’re feeling more active, take advantage of the water sports on offer. Take a boat trip to the nature reserves of nearby Hon Mun and Hon Tam islands, which have thriving coral reef systems. Go snorkelling or scuba diving to catch a glimpse of this underwater wonderland. What: Ho Chi Minh City, still commonly referred to as Saigon, is Vietnam’s largest city and the country’s business capital. Split into 24 districts, Saigon was once a prominent seaport and later, the capital of Southern Vietnam. Today, it’s a modern metropolis filled with fancy roof-top bars, clubs, restaurants and glassy office blocks. There’s plenty of history to be found here too, with French buildings such as Notre Dame Cathedral, Chinese pagodas, decorative temples and museums. For a change of pace, visit the leafy parks or do some shopping at the sprawling Ben Thanh Market where you can barter for clothes, handicrafts and everything in between. The lesser-visited Ho Thi Ky Flower Market and Cho Lon China Town are also worth a look. 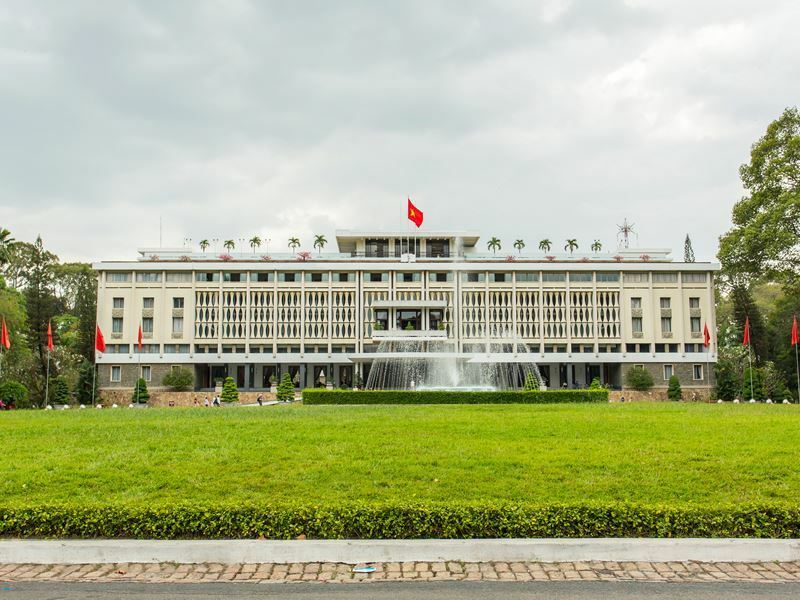 Highlights: Learn about some key events in Vietnam’s history by visiting the stirring War Remnants Museum and the Reunification Palace. You can also take a day trip from Saigon to the Vietcong’s claustrophobic Cu Chi Tunnels and learn about the booby traps they used to fend off American soldiers. 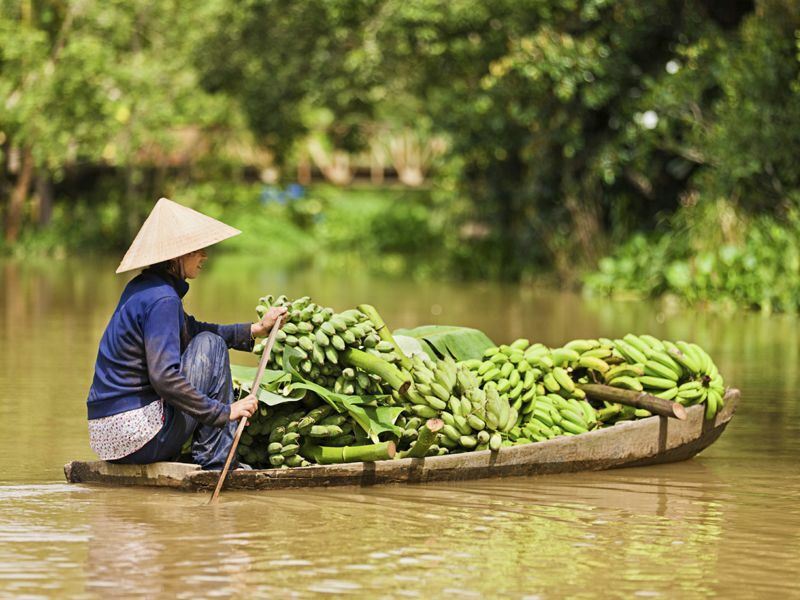 What: The Mekong Delta is Vietnam’s rice bowl, a fertile area of canals and lush green paddy fields that produces over a third of the country’s annual rice quota. Boats are the main form of transport in this maze of rivers, islands and swampland and the best way to explore. Take a trip down the Mekong to soak in the scenery and spot famers in conical hats picking rice while fishermen trawl the waters. To experience a real slice of local life, visit the many floating markets and craft workshops that abound in the Mekong Delta. Back on land many visitors stay in the delta’s largest town, Can Tho, but there are many smaller riverside villages as well as ancient pagodas and orchards to visit. Highlights: An early morning trip to a floating market offers a captivating insight into Vietnamese life. Watch people trade and barter, buy some handicrafts and sample tasty snacks and produce. When you’ve finished on the water, take a gentle cycle ride through the peaceful villages on the banks of the river. Where: Kien Giang Province, off the coast of Southern Vietnam. 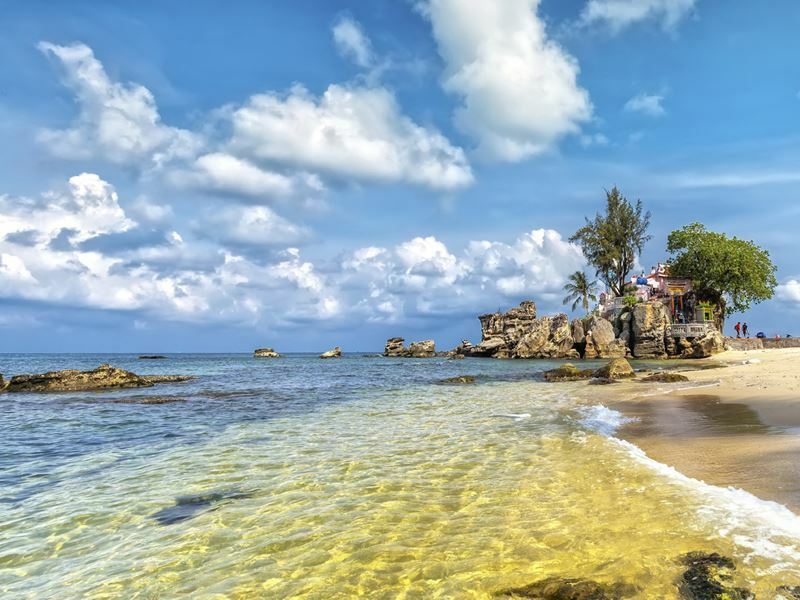 What: The jungle-covered island of Phu Quoc has fast become Vietnam’s favourite island destination. Its quiet bays are characterised by fine white sands dotted with coconut palms and crystal waters teeming with coral reefs and marine life. Take a dive trip or hire some snorkelling gear to get a glimpse of the underwater world. Long Beach is the most idyllic stretch of sand, perfect for soaking up the sun but there are also plenty of quieter coves and bays. To get a view over Phu Quoc and the sea, hike to the top of Mount Chua, the highest point on the island. Highlights: Half the island is designated as Phu Quoc National Park, which is a protected, bio-diverse area. Walk or cycle along its jungle trails for a chance to see rare wildlife including lorises, Silver langurs, hornbills and Long-tailed macaques. Don’t forget to sample Phu Quoc’s famous black pepper and fish sauce while you’re on the island. It’s possible to visit all of these iconic Vietnamese destinations while travelling the length of the country from north to south, as part of an escorted tour itinerary. However, if you’re still hungry to see more of Southeast Asia, why not add on a visit to one of Vietnam’s neighbouring countries? Head across to lesser-visited, sleepy Laos to encounter orange-robed monks and sparkling temples in Luang Prabang. Just west of Saigon you’ll find Cambodia, where you can see one of the region’s most visited attractions, mighty Angkor Wat. If you’re more in the mood to unwind, opt for a paradisical beach break in Thailand.